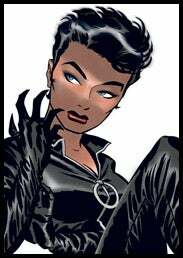 in addition to the game taking place in a segment of Gotham City, Selina Kyle, aka Catwoman, will also play a central role in the game. and her long, complex history with the Dark Knight. slums into a new facility run by Dr. Hugo Strange. both, which is why we're so excited about her involvement. writers have added new depths and layers to her personality. costume and take up high stakes burglary by Batman's debut on the scene. crime to pull herself up from a rough upbringing. she underwent her second major revitalization courtesy of writer Jeph Loeb in his and artist Tim Sale's two follow-ups to Year One - The Long Halloween and its sequel, Dark Victory. protector of Gotham's downtrodden East End. femme fatale back closer to her roots as a villain. in the Gotham City Sirens series. another for her own benefit. breakout star of Rocksteady's blockbuster Batman franchise.